This month, Central is collecting canned goods and non-perishables for The Assistance Center of Towson Churches (ACTC). Help those in need in our community in this simple way. Please drop off items in the collection bins at Serve Central. 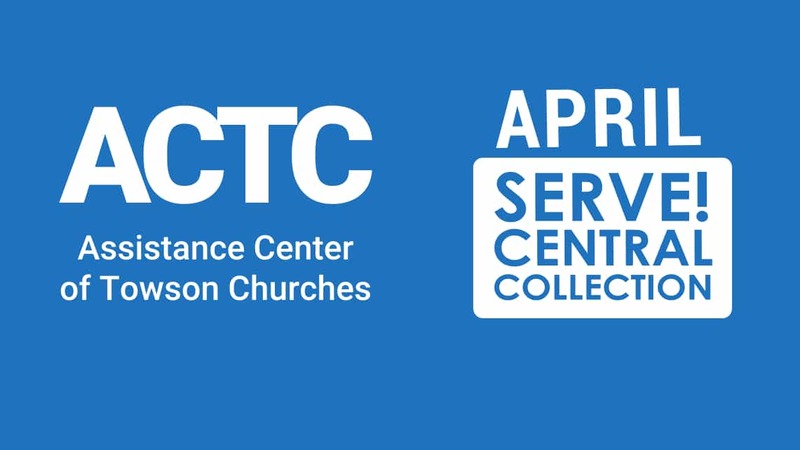 The ASSISTANCE CENTER OF TOWSON CHURCHES (ACTC) opened its doors in 1985 to provide emergency help, including food, eviction and utility cutoff prevention, payment for prescriptions, and lunches for the homeless. It began as the result of a study conducted by the Towson Area Ministerial Association exploring an effective and efficient way to meet the needs of people coming to churches requesting help. Currently, with the support of 50 churches and other generous donors, its service area incorporates 21 zip codes in central Baltimore County extending up to the Pennsylvania line. Want to know more about this ministry?